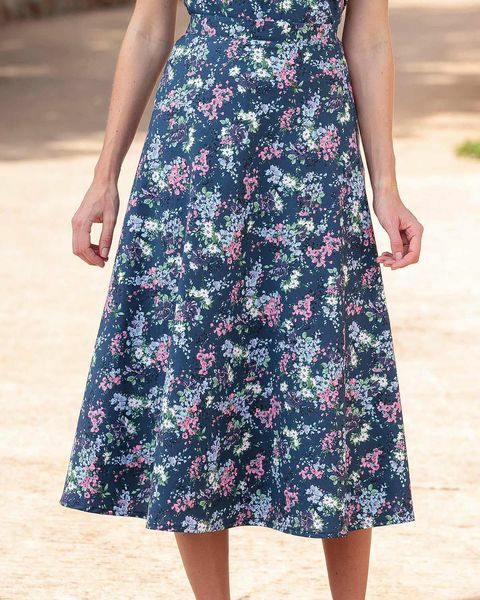 Ladies June Floral Pure Cotton Skirt. Machine washable. Sizes 8-24. Ladies flattering bias style skirt with side zip and button fastening and featuring side back waist elastication for comfort. Pure cotton floral print in tones of greens, blues, pinks and lilac on a navy base. Lightweight and versatile. Coordinate with any of our collection of blouses and knitwear to achieve a stylish look.